Give them all a go, and compare notes with fellow enthusiasts. Two-wheel it around the community to get the lay of the land. The kitchen is command central. Give your crew their marching orders for the day while finishing up breakfast. Maybe start with the lagoon-style pool onsite and go from there. Your kids will love the arcade, children's club and the children's pool! Luau at Sandestin is located in Miramar Beach, Florida and blends elegance and simplicity with a distinctly Asian flair. After getting settled into your condo, grab goggles and pool toys and spray everyone in sunscreen before going to the outdoor pool with waterfall. Little ones will have a blast splashing around in the children's pool. Pull up a lounger and relax with the latest issue of People magazine and a cocktail from the poolside bar. I have a feeling that you’re going to be here for a while so you might as well get comfortable. Get in touch with your inner-Serena Williams at the tennis courts while the kids hang out in the arcade or at the children’s club. Need a mid-afternoon pick-me-up? Good news! The resort has three coffee shops on-site. Take advantage of the resort’s free bike rentals and explore the grounds. 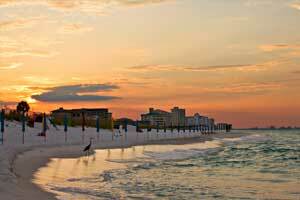 Luau at Sandestin is a short walk to the beach. Set up camp on the sand and work on your sun kissed look while the little ones hunt for seashells or build sandcastles. Guests of the resort receive access to four championship golf courses, get ready to work on your swing. Resort guests also receive access to four pools, try them all before deciding which one to spend the day at. Head to the Serenity by the Sea Spa for a massage, nail treatment or facial – you deserve it for your amazing vacation planning skills. Gather all of the tennis enthusiasts in your crew and head to Sandestin Tennis Center, just under two miles from the resort. The Village of Baytowne Wharf features a variety unique shopping. Coconut Kids features children’s clothing and toys. Surprise your little princess with a new doll from Dolls & Friends. They also offer a selection of unique doll clothing. Island Clothiers features apparel and footwear for all ages. Paradise Found is the place to go for beach souvenirs. Waterfront Gifts & Art has unique handcrafted art, jewelry and gifts. Grownups-only night out? Fat Tuesday Daiquiri Bar serves cocktails, snacks and wings. Catch the big game on the flatscreen TVs. Or dance the night away at John Wehner's Village Door Nightclub. - Check-in for this property is based at the Sandestin Welcome Center located at 9300 Emerald Coast Parkway. Miramar Beach, FL 32550. For more details, please contact the office using the information on the reservation confirmation received after booking. Rollaway/extra beds are available for USD 11.00 per night. Cribs (infant beds) are available for USD 9.00 per night.